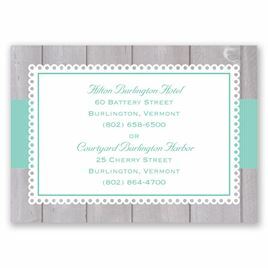 For a handmade look without the fuss of DIY, choose this rustic fence accommodations card with grosgrain ribbon accent. The ribbon and wording are printed in your choice of colors and fonts. This enclosure fits within a folded seal and send and is secured by the clear seals included with the invitation.